Like all other RPG games, Marvel Avengers Alliance also allows players to level up for building up a better player character/team. The faster you will level up, the better the chance that you will be ahead of many players. Needless to say that you and your team members are getting more and more stronger and win all the missions/PvP. The above picture shows how it looks like once you will level up in Avengers Alliance. As you can see, as soon as you level up your character gains additional points (in green) for Health/Stamina/Attack etc. Therefore it is important that you constantly level up yourself. 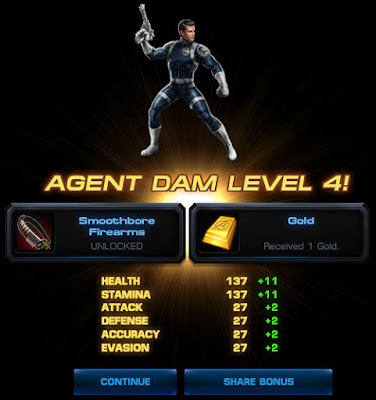 This post is aiming to give you some of the best tips on how to level up faster in Avengers Alliance. The tips are suitable for both the beginners as well as experience players. Spend energy to gain maximum experience. You have 60 energy points. You spend 10 energy per fight. The strong fight will give you maximum experience while low threat fight will acquire minimum. So try to choose wisely your fight to level up quickly. Get experience for your heroes from flight deck remote ops. Choose wisely remote operations. If you are online, then make shortest remote ops. Choose longer remote ops when you plan to go offline for quite some time. Add more and more allies will give you bonus energy points. Simple equation. The more allies you have, more energy you will get visiting their building/profiles. The more energy you will acquire, more fight you can do and earn experience points faster. If you are on full energy never visit and click on buildings. Gift energy to your allies. The more you will give the more you will get. The minimum 1 energy pack contains 2 energy, so if you give 5 energy packs, you will be getting 10 additional energy. That means an extra fight to earn experience. Complete goals or missions. Easiest and fastest way to gain experience and therefore leveling up. Try to complete goals or missions as soon as possible. After successful completion of each goal/mission you will be rewarded with good amount of experience. Get experience from PvP. Every PvP win will provide 5 experience. Not a huge amount but every little bit counts to level up yourself. Just remember, experience needed per level up is like exponential increment. You never need same experience number for next level but little bit more and so on. Above are some of the guidelines to get your level up quickly. If you like to share any tips on Marvel Avengers Alliance level up, feel free to post/comment. Let's become pain bringer to all the evils. If you like the post, please "Like" and share with your friends. Thanks to you as well for visiting...glad that you find this useful. Do you have any suggestion which you are using on your own to achieve faster leveling up? I never seem to have enough to level, it's like always a shortage of gold, silver or shield coin. I just started and it's like training costs! Must you pretty much pay to level in this game? Marvel Avengers Alliance is awesome game and I play it frequently. For good support, I contact gameskip.